On Route 9 from points east: Follow Route 9 into the town of Ware. Pass under a railroad bridge and cross the Ware River; the old mill yard will appear on the left. 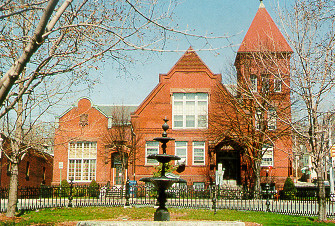 The red-brick library is on the northwest corner at the first traffic light. Parking is available on the street. If you turn right onto Church Street, you can access the library parking lot at first left-hand turn. The two spaces in front of the library are reserved for 15-minute parking. On Route 9 from points west: Follow Route 9 into the town of Ware. Use caution at the flashing traffic light and subsequent stop sign; all the other lines of traffic have the right-of-way and will not stop. Proceed straight along Main Street and through the next traffic light. The red-brick library is on the left at the next major intersection. Parking is available on the street. If you turn left onto Church Street, you can access the library parking lot at first left-hand turn. From the Massachusetts Turnpike: Take Exit 8, marked “Palmer.” After passing through the tollbooths, turn left at the traffic light and onto northbound Route 32. Follow Route 32 approximately eight miles to Ware, passing Wal-mart on the right and passing the Ware Public Schools and McDonalds on your left. At the flashing yellow traffic light, turn right onto Main Street. Proceed through the next traffic light. The red-brick library is on the left at the next major intersection. Parking is available on the street. If you turn left onto Church Street, you can access the library parking lot at first left-hand turn. The Road Less Traveled: From Route 2 in northeastern Mass., take Exit 21, marked “Templeton.” Follow Route 101 south/west to Route 32. [From northwestern Mass., take Exit 17, marked “Athol,” and follow Route 32 south.] After passing through Petersham, follow Route 32A south. Link up with Route 32 again in Gilbertville, heading south to Route 9. Follow Route 9 into the town of Ware. Pass under a railroad bridge and cross the Ware River; the old mill yard will appear on the left. The red-brick library is on the northwest corner at the first traffic light. Parking is available on the street. If you turn right onto Church Street, you can access the library parking lot at first left-hand turn. The two spaces in front of the library are reserved for 15-minute parking. This Road Less Traveled is a scenic two-lane drive through the western Mass. woods, offering occasional glimpses of the Quabbin Reservoir. Watch for wild turkeys and whitetail deer.